Be the first to share your favorite memory, photo or story of Ayleen. This memorial page is dedicated for family, friends and future generations to celebrate the life of their loved one. 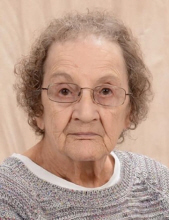 Cherryville - Mrs. Ayleen Wright Shook, 82, passed away on Thursday, November 15, 2018 at Atrium Healthcare in Lincolnton. Mrs. Shook was born on November 22, 1935 in Cleveland County, NC. She was retired from Burglar Alarm Company in Hickory. Mrs. Shook was a member of Bright Light Tabernacle in Hickory. In addition to her parents she was preceded in death by her husband Carl Wright. Survivors include three sons, Danny Wright and wife Pam of Cherryville; Douglas Wright of Kings Mountain and Gary Wright and wife Debbie of Cherryville; two daughters, Phyllis Hannon and husband Mike of Blacksburg, SC and Sherry Miller and husband Brian of Hickory; a sister, Hazel Jones of Hickory; two brothers, William York of Shelby and Ray York of Hickory; 11 grandchildren, 27 great grandchildren and one great-great grandchild. Visitation will be from 11:00 AM to 12:15 PM on Monday, November 19, 2018 at Stamey-Cherryville Funeral Home & Cremation Service. Funeral Services will be held at 12:30 PM on Monday, November 19, 2018 at Stamey-Cherryville Funeral Home Chapel with Revs. Leroy Davis and Ray York officiating. Burial will be at City Memorial Cemetery in Cherryville. Memorials may be made to Bright Light Tabernacle 2777 Highland Ave NE, Hickory, NC 28601. To plant a tree in memory of Ayleen Wright Shook, please visit our Tribute Store. "Email Address" would like to share the life celebration of Ayleen Wright Shook. Click on the "link" to go to share a favorite memory or leave a condolence message for the family.